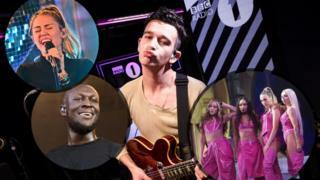 Stormzy has been added to the line-up of Radio 1's Big Weekend 2019 in Middlesbrough, joining Little Mix, The 1975 and Miley Cyrus. The event will take place at Stewart Park and will also feature performances from Zara Larsson, Mabel and Khalid. While announcing names like Billie Eilish and Vampire Weekend on the Radio 1 Breakfast Show, Greg James said: "I'm just putting it out there - this is one of the best yet." Big Weekend will on 25 and 26 May. Little Mix say they are "so excited" to perform at the event, now in its 16th year. It'll be the fourth time The 1975, who won two Brit Awards last month, have played Big Weekend but they said it's "great to be coming back, this time as headliners". Mumford & Sons, Future and Sean Paul have also been added to the bill. Other names playing at the festival include Sam Fender, Rita Ora, Bring Me The Horizon and and Anne Marie. Lewis Capaldi, Jess Glynne, The Amazons, Two Door Cinema Clue, Ellie Goulding and Catfish & the Bottlemen are also among the latest additions to the bill. Who has performed at Big Weekend in recent years? The Mayor of Middlesbrough, Dave Budd, described the announcement as "a major coup for Middlesbrough" and he's looking forward to "welcoming the world" to his town. Other names heading to the festival include Fredo, HRVY, Jax Jones, Pale Waves, Camelphat and Sigala. Tickets are available from 14 March - here are all the details about getting hold of them. More information on how to get tickets will be released in the coming weeks.